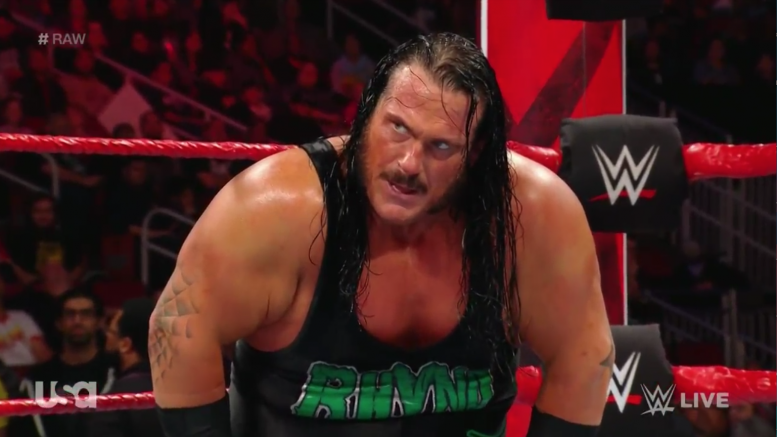 After wrestling Heath Slater for his job on Monday Night Raw, Rhyno now seems to be a free agent. The match came about after Raw General Manager elect Baron Corbin crunched the numbers and determined he couldn’t keep both wrestlers on the show. He then forced the first-ever Smackdown Tag Team Champions to face-off, with the winner getting to keep their job. After hitting a jumping neckbreaker, Slater pinned Rhyno and sent the ECW original packing. Things weren’t all positive for “The One Man Band” though. After getting back behind the curtain, Baron Corbin informed Heath that he wouldn’t be continuing as a wrestler … he’ll now be a referee. No word yet on whether Rhyno is merely switching brands or if this was WWE writing off the over 20-year veteran from television. We’ll keep you updated as additional information becomes available. Do you want to continue seeing “The Gore Machine” on WWE TV? Sound off in the comments.